For over 20 years now Sea Kayak Adventures has created wilderness vacations for active, outdoor-minded travelers, by offering not only a combination of fun, challenge and excitement, but also inspiring adventures designed to rejuvenate your body and spirit. Sea Kayak Adventures is all about going to beautiful BC west-coast places to get away from it all, learning new skills, having once-in-a-lifetime wildlife encounters, meeting great people and introducing you to an eco-friendly way of travel. 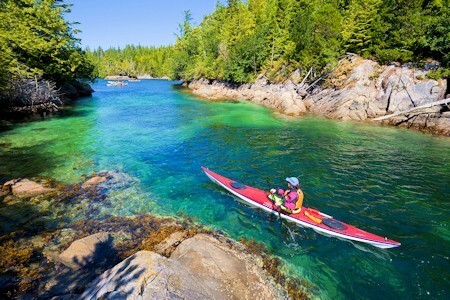 British Columbia is an incredible environment for sea kayaking with killer whales ... and the Inside Passage is a sheltered, glacier-carved waterway between the northeast coast of Vancouver Island and the snow-capped mountains of mainland British Columbia. A focal point, Johnstone Strait allows us the best opportunity to view orcas up close from a kayak, as these scenic waters contain the highest density of killer whales anywhere in the northern hemisphere. Our award-winning tours are nationally acclaimed. In 2009, National Geographic Adventure Magazine rated Sea Kayak Adventures as one of the "Best Adventure Travel Companies on Earth". National Geographic Traveler Magazine our orca kayak tour in their Best Whale Watching Destinations. Guaranteed Orcas! 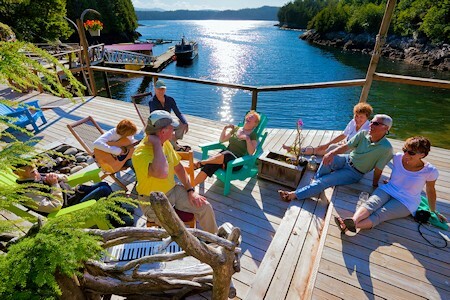 4-day Orca Kayak Basecamp in the heart of the "orca loop" in Johnstone Strait, the best place on earth to view orcas. Stay at our exclusive basecamp beach near Robson Bight and discover why this beach is one of the most special in the Strait! 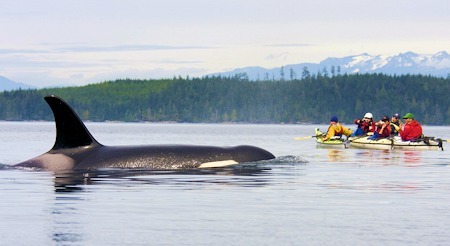 Kayak with orcas in the BEST spot on the planet: Johnstone Strait. Over 220 fish-eating killer whales congregate in this part of Vancouver Islands Inside Passage each summer to feast on the prolific salmon runs concentrated by the geography of the strait. The sheltered waters of Johnstone Strait create ideal conditions for sea kayaks, as these generally calm waterways also host other phenomenal marine life like dolphins, humpback whales, porpoises, seals, sea lions, sea birds, and a myriad of fascinating tidal animals as well as the famous orcas. Sea kayaking in Haida Gwaii (Queen Charlotte Islands) is a spectacular experience. From remote wilderness travel, fantastic wildlife, and a rich First Nations heritage, this area encompasses it all. 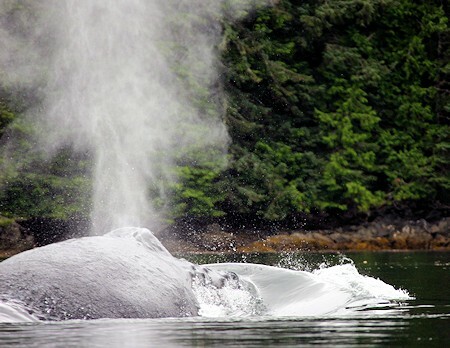 If you are looking for a true wilderness experience that has you traveling through a rich and diverse ecosystem along with rich Haida culture, then this is the trip for you! Our kayaking expedition in Broughton Islands Marine Park offers fantastic paddling in a remote island archipelago with wilderness campsites, secluded kayaking away from other people, and incredible wildlife including humpback whales, orcas, Steller's sea lions; pristine intertidal and old growth forest. If you enjoy nature and wilderness, this west-coast Canadian sea kayak trip is a must. Our popular lodge-based kayak tours in Gods Pocket Provincial Park in Queen Charlotte Strait are designed for those who wish to experience sea kayaking without having to camp. Enjoy comfortable rooms with hot showers and great food cooked daily from scratch by the lodge's onsite chef. 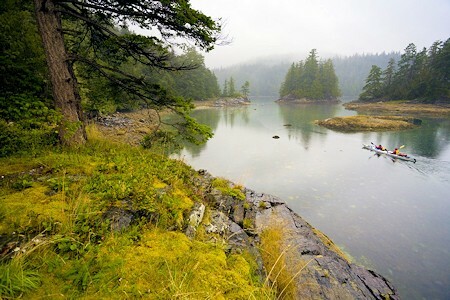 The sheltered waters of Johnstone Strait create ideal conditions for sea kayaks, as these generally calm waterways also host other phenomenal marine life like dolphins, humpback whales, porpoises, seals, sea lions, sea birds, and a myriad of fascinating tidal animals as well as the famous orcas. Join us for a fully-catered, fully-guided, and fully-supplied tour in extraordinary wilderness to see these majestic mammals. Plan the perfect custom trip for your group with Sea Kayak Adventures. A Sea Kayak Adventures tour can be fully customized to best suit your group. Paddle as much or little as you would like and choose additional tour options, such as Kayaking ... Gray Whale Watching ... Yoga and more. There is nothing more we love than sharing our passion for adventure, commitment to conserving the environment, and love of discovery with you. 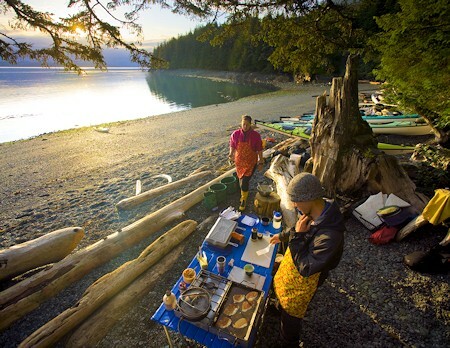 We invite you to join us on an unforgettable British Columbia sea kayak wilderness adventure. Come see what you can accomplish, and change your life, with Sea Kayak Adventures!